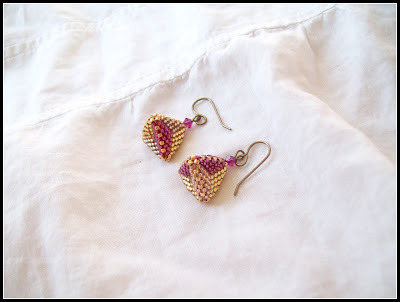 Amybeads: BTW - oh wait - it's Thursday! BTW - oh wait - it's Thursday! 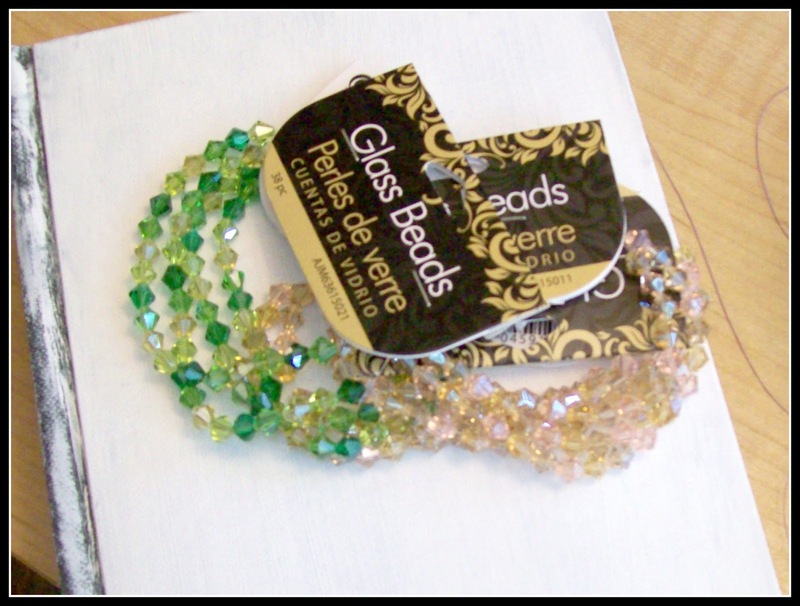 Click here for Beads Soup Blog Party Reveal and participants! Well - I had intended to blog on Tuesday to talk about how my What's It To Hue? project is going....but it's not really going yet...I only so far have picked out some beads. Next Tuesday I will post up some more progress and more on the palette! Don't forget if you would like to play along there is more info here, and the reveal for What's It To Hue? is on October 4th. 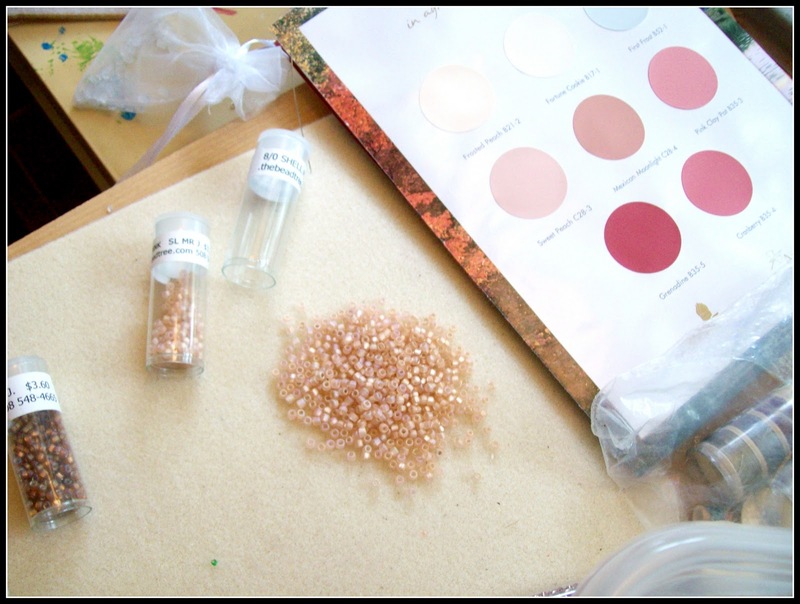 When I began to collect my materials for this project, I discovered a funny thing....I seem to have something against size 6mm beads!!! Seriously! I have been beading for some 17 years now....and I have also procured quite a large stash. 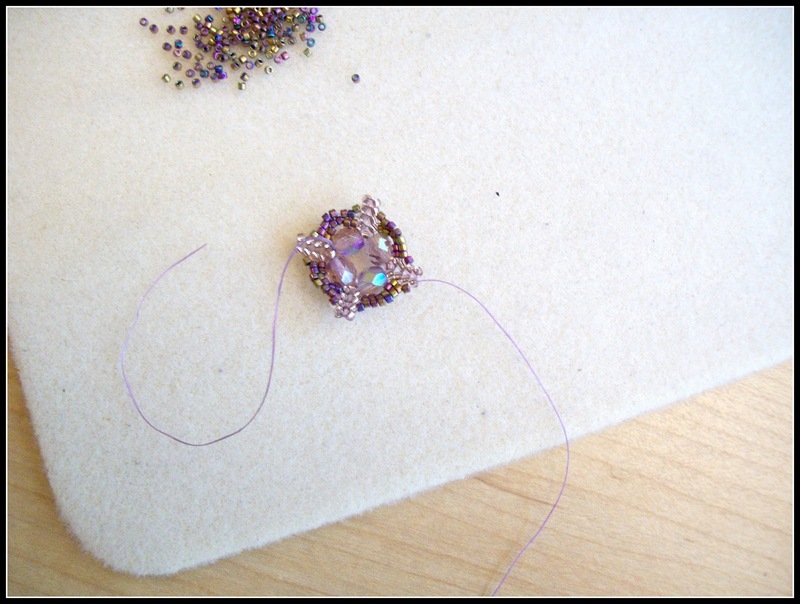 So I started by looking for the bead that was called for - a 6mm bicone. So I wnt through my Swarovski stash and found 3mm's, 4mm's, and 8mm's - but not a single 6mm! So then I checked through my Czech glass and had plenty of the previously mentioned sizes, but only ONE SINGLE strand of 6mm fire polished rounds! 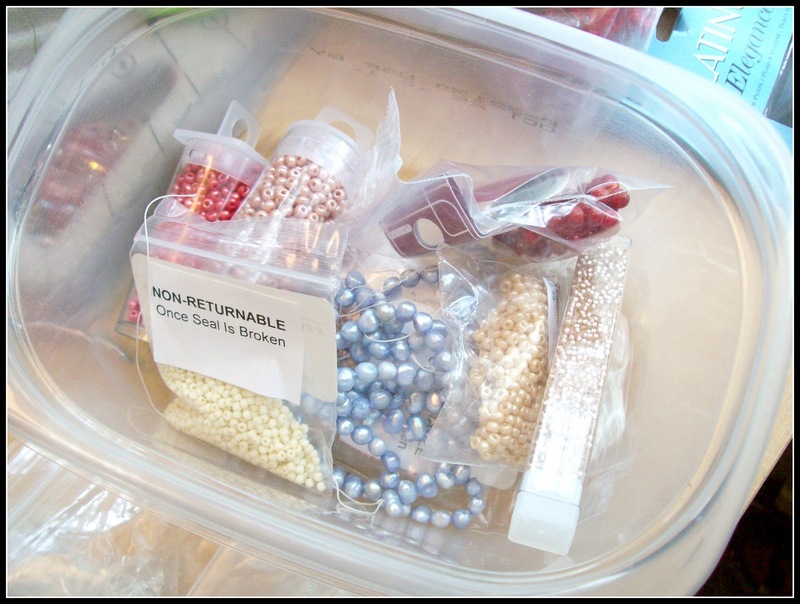 (Then strictly out of curiosity I inspected other categories of beads and found NO OTHER 6mm beads in my stash!!!) In any case the pattern seems to be working out with the rounds, but during a pass-through of the craft section at Wal-Mart, I picked up a couple strands of 6mm bicones just so I can also try to stay true to what is called for on this pattern! So are you checking out all the Bead Soup Blog Party reveals?! I have to say - thanks - I am really humbled by all the nice comments I received over the past few days.....it's really true what they say about comments, they are like crack to a blogger! In the meanwhile - I am getting STUFFED consuming all this Bead Soup. But I'm loving it. The last time I tallied it up - I am about a third of the way through the list, and I truly plan to visit them all! The creativity is mind-blowing. I especially love seeing the ones where the beader had to step far outside their comfort zone. Earlier this month I completed these pieces for my best friend's birthday! I saw this pattern in a recent bead magazine loved the quilt-like quality of the pattern. I used a vintage Czech button for the clasp and actually pulled the colors for the bracelet together based on the button! 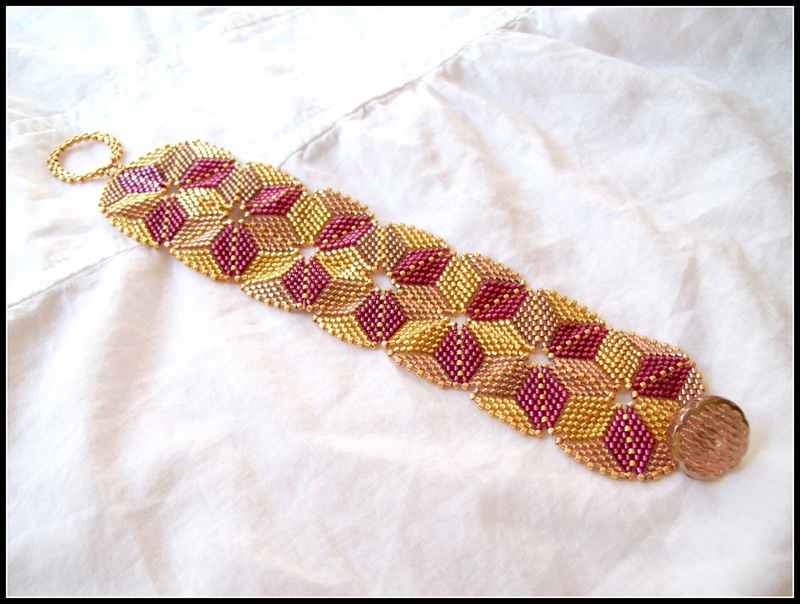 That Bracelet set is awesome--Very Quilt like and Stunning--I Love it! Yes, clearance sales are a weakness that can not be resisted for long.. especially when the deals are that good :D And I'm jealous... my WalMart doesn't have much of a selection of the bi-cones or crystals in the Cousin's packs :( The only ones I've seen are the clear in the 4mm I think. Well you know I reckon those firepolished rounds are working a treat... I am intrigued to see how different the piece looks in the end. I l♥ve your bracelet too... can you share which magazine/issue this was in as I'd love to give this one a try - the quilt like effect is quite nice and I love your colours! Keep up the great work with those Camelot Crosses! Oh, you did a great job on that pattern! 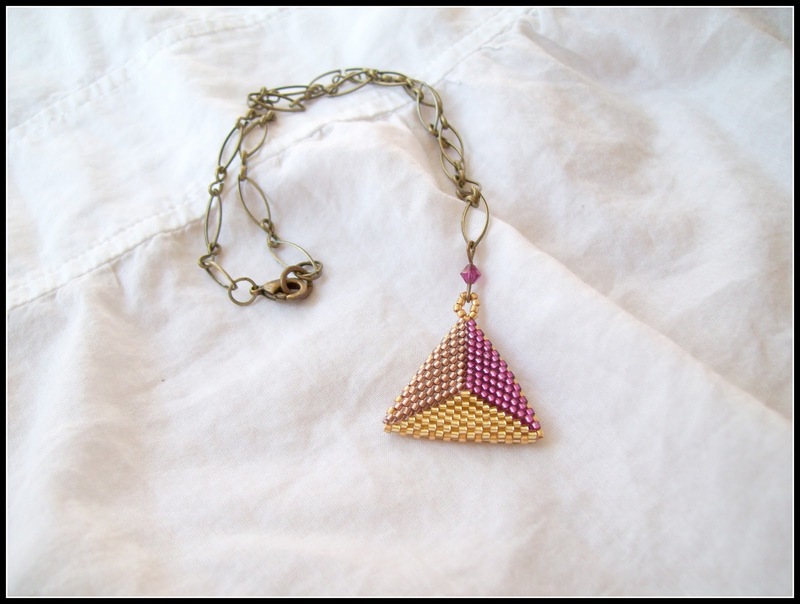 And I adore the matching earrings and necklace, that was a good idea. Bead Soup Blog Party - REVEAL! What's It To Hue? Tuesday - new palette!